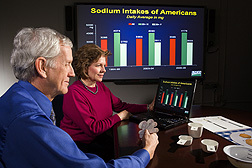 Clifford Johnson, director NHANES Program, Centers for Disease Control and Prevention, DHHS, and Alanna Moshfegh, ARS research leader at the Food Surveys Research Group, Beltsville Human Nutrition Research Center, review sodium intake data from “What We Eat in America,” the dietary intake component of the National Health and Nutrition Examination Survey. Science-based dietary-intake data from the Agricultural Research Service provides a key foundation for multiple public health policy publications, including the council’s strategy report, published in June 2011. The report cites the ARS national dietary-intake survey data to underscore the ability of everyday people to improve their health through healthy eating and other preventive measures. Collecting data on what we eat in America is a key monitoring step that connects what Americans eat to their nutrition and health status and to health outcomes. Research nutritionists work on translating “foods eaten” into “nutrients consumed” to get a snapshot of the population’s nutrient-intake status. The dietary-intake survey data—after analysis—helps inform major nutrition policy, such as food fortification regulations, nutrition education, food assistance and safety programs, and various dietary guidelines. Based on national survey data analyses, grain-based desserts account for a greater proportion of daily calories than any other food group in people age 2 and older. The federal government has a long history of monitoring the nation’s nutrient intakes. Nearly 50 years ago, Congress mandated that a regularly conducted national survey be launched to collect statistical data about the dietary intake and health of people in the United States. About 10 years ago, the U.S. Departments of Agriculture (USDA) and Health and Human Services (DHHS) combined two separate federal nationwide dietary surveys into one, which is developed and managed by researchers at the ARS Beltsville Human Nutrition Research Center (BHNRC) in Beltsville, Maryland. “This effective government partnership has led to cutting-edge technologies and methods being used in a single process for collecting and analyzing nationwide food and nutrient intakes,” says Allison A. Yates, a registered dietitian and associate director of the Henry A. Wallace Beltsville Agricultural Research Center, where BHNRC is located. The mission of the BHNRC is to monitor dietary consumption and assess dietary patterns within the U.S. population. Federal, state, and local policymakers rely on such evidence-based nutritional science to develop nutrition programs. For example, the National Prevention Strategy report cites multiple key indicators based on the “What We Eat in America” survey findings. Most U.S. adults consume, on average, more than twice the maximum daily sodium intake recommended by the government. Reducing average population sodium intake to 2,300 milligrams per day—the recommended maximum for adults with no known risk factors such as hypertension—could potentially save $18 billion in healthcare costs annually, according to the report. The survey data show that people consume the equivalent of more than 1.5 teaspoons of salt—nearly 3,430 milligrams of sodium—each day. 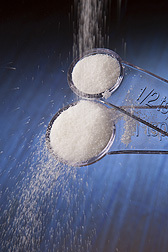 Most U.S. adults consume on average more than twice the maximum daily sodium intake recommended. In 2005-2006, the “What We Eat in America” survey data showed people consumed nearly 3,436 milligrams of sodium each day—that’s more than in 1.5 teaspoons of salt. This is sodium that is mostly added in food processing. Salting food at the table is difficult to measure, but is estimated to add less than one-fifth of the total. Overall, sodium intakes through 2007-2008 have remained relatively unchanged and are comparable to intakes observed in the 1994-1998 survey, according to the dietary survey data. While the BHNRC survey group’s primary focus traditionally has been tracking the population’s food intake, the group now also provides data on dietary supplement intakes collected during the annual national government survey. For the first time, in 2011, the BHNRC survey group released data tables that summarize “Total Nutrient Intakes” in the United States. The tables include individual nutrients people consumed from foods and from supplements. Still, dietary supplements are widely used, and they contribute to nutrient intakes, so it’s important to accurately monitor people’s nutrient intakes from both supplements and foods. For example, 48 percent of women aged 20 years and older and 38 percent of men aged 20 years and older report using supplements, according to the national survey data. “The data also shows that older people tend to take supplements more often than younger people,” says FSRG nutritionist Donna Rhodes, who heads the development of the tables. Nearly 60 percent of women aged 60 and older, for example, take a supplement that contains calcium. 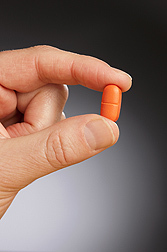 But only about 22 percent of women aged 20 to 39 years take a supplement containing calcium. 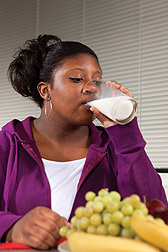 Among adolescents, use of calcium-containing supplements drops even more. Among those aged 12 to 19 years—both boys and girls—about 11 percent took a supplement containing calcium. Unfortunately, the average intake for milk has been decreasing among kids and adolescents while soda consumption has been going up. For adolescents, the percentage reporting milk consumption on a given day 30 years ago was 76 percent, but by 2005-2006, that percentage had dropped to 49 percent, according to FSRG data. The Dietary Guidelines for Americans encourage people aged 9 years and older to consume 3 cups per day of fat-free or low-fat fluid milk or equivalent milk products, which are major sources of vitamin D and calcium. Yet BHNRC 2005-2006 survey data shows that the average intake of fluid milk was around three-fourths of a cup. Among the many findings, the new “Total Nutrient Intake” tables confirm what has long been suspected: People who take dietary supplements in general have higher nutrient intakes from the foods they choose than do those who don’t take supplements. “Many who are in most need of additional nutrients due to poor dietary choices do not choose to take supplements,” says Yates. The “What We Eat in America” survey results show that although the U.S. food supply is abundant, many U.S. residents are experiencing nutritional shortfalls. That’s based on the results of earlier surveys of dietary food and beverage intakes that were gathered before supplement intakes were evaluated and included. The ARS Beltsville Human Nutrition Research Center in 2011 released data tables that summarize not only nutrients gained from foods and beverages consumed—but for the first time also from supplements consumed. When compared to the Recommended Dietary Allowances, the national “What We Eat in America” survey has shown that more than half of the people in the United States aren’t getting ideal levels of magnesium; about 40 percent aren’t getting enough vitamin A; and nearly one-third aren’t getting enough vitamin C from the foods and beverages they consume. In addition, researchers at the National Cancer Institute (NCI) produced 39 tables based on the national “What We Eat in America” survey data, which was used by the Dietary Guidelines Advisory Committee in formulating the 2010 guidelines. Such data is used to develop recomended Food Patterns. For example, while we should be eating—depending on age range—between 1 and 2.5 cups of fruit per day, the dietary-intake survey data shows most adults eat less than 1.5 cups per day, according to NCI analyses. While we should be eating between 1.5 ounces to 5 ounces per day of whole grains depending on age range, most age groups and both sexes are eating less than 2 ounces of whole grains per day, according to NCI’s Susan Krebs-Smith. Krebs-Smith also says that while the recommendation for a typical 2,000-calorie-per-day Food Pattern is 7 cups of red, orange, and dark-green vegetables per week, the ARS dietary-intake survey data shows the average American eats only about 3.5 cups per week. The USDA Food Patterns, based on the 2010 Dietary Guidelines for Americans, encourage reducing intake of calories from fats and sugars, and there is a limit based on an individual’s overall calorie needs. For someone who fits into the 2,000-calorie per-day USDA Food Pattern, male or female, the maximum is 258 calories from fats and sugars. Based on USDA Food Patterns, depending on age range and calorie needs, people should be eating between 1.5 ounces to 5 ounces of whole grains daily. 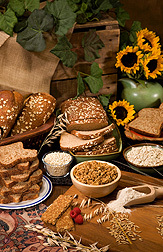 But most age groups are eating less than 2 ounces of whole grains per day, according to ARS survey data analyses. The national “What We Eat in America” survey data is also used by other government policymakers. “One of the many uses of dietary intake data is to keep pace with the serving sizes people consume and what serving sizes work in terms of those used on food labels,” says Alanna Moshfegh, FSRG research leader. She collaborates extensively with colleagues with the U.S. Food and Drug Administration’s (FDA) Nutrition Assessment and Evaluation Team. At this time, FDA bases label serving sizes on reference amounts per eating occasion for specific food product categories. In principle, foods with similar dietary usage have uniform reference amounts so consumers can make “like-product” nutritional value comparisons. “Currently, these reference amounts are derived from nationwide food-consumption survey data from the 1970s and 1980s,” says Moshfegh. “But much has changed since then.” FDA is now working with Moshfegh and colleagues at FSRG to redefine serving sizes using key data indicators from the ARS national “What We Eat in America” survey. 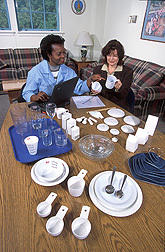 Using the computerized dietary-intake survey program that was developed and validated by BHNRC scientists, an interviewer, nutritionist Grace Omolewa-Tomobi (left), helps a participant recall portions of the foods and beverages she consumed while being surveyed. The national “What We Eat in America” survey is also used by FDA’s Center for Food Safety and Applied Nutrition in an ongoing program to monitor exposure to levels of various pesticides, radionuclides, elements, and industrial chemicals in foods. The FDA program develops baseline information on the levels of these substances in the U.S. food supply. Foods are prepared as they would be consumed—table ready—before analysis, so the analytical results provide the basis for realistic estimates of the dietary intake of those elements, called analytes, once the amounts typically consumed are determined. In addition, the U.S. Environmental Protection Agency (EPA) uses ARS national dietary survey data when evaluating pesticide exposures in all segments and age groups of the U.S. population. “EPA regulates and sets limits on pesticide residues on foods, which are called ‘tolerances,’ or maximum legal residue limits,” says David J. Miller, chief of EPA’s Chemistry and Exposure Branch, part of the Health Effects Division, which is responsible for reviewing and evaluating data on pesticides, as well as assessing and characterizing exposure and risks to humans. 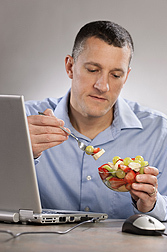 Men should get 2 to 2.5 servings of fruit daily, but most men are getting only slightly over 1 serving a day, according to survey data analyses. 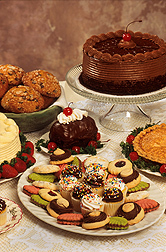 The ARS national “What We Eat in America” computer-based dietary survey interview is conducted continuously, and data is reported in 2-year groupings. FSRG provides periodic Dietary Data Briefs, which focus on a single topic and highlight key results that are of interest to both consumers and professional users. FSRG has examined 2007-2008 survey data from 5,334 adults aged 20 years and older for a brief that focuses on snacking, which is associated with increased calorie intake and decreased nutrient intake. Snacking is a dietary behavior that has increased in recent decades in the United States—while the percentage of the population who are overweight and obese has also increased. The briefs indicate that snacks provide about one-third (32 percent for women and 31 percent for men) of all daily calories from solid fats and added sugars. The average intake of solid fat and/or added sugars for men aged 20 and older surveyed in 2007-2008 was 923 calories per day. So men on average are consuming 2 to 3 times their limit in the fats and sugars category. 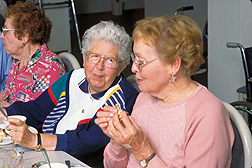 For women aged 20 and older, the average intake of solid fat and/or added sugars was 624 calories per day. So women on average are consuming almost 2 to 4 times their limit in that category. There is a positive side to snacking, however, according to FSRG nutritionist Rhonda Sebastian, who headed up the snacking patterns Dietary Data Brief. “Snacks provide just over one-third of the total daily fruit intake for both men and women, which is already low in the American diet,” says Sebastian. For example, women are recommended to get 1.5 to 2 servings of fruit daily, but most women are getting only 1 serving of fruit a day, and nearly half that comes at snack time. Men are recommended to get 2 to 2.5 servings of fruit daily, but most men are getting only slightly over 1 serving of fruit a day, with nearly half of that coming at snack time. “Choosing a food group pattern recommended in the Dietary Guidelines for Americans can generally help people better reach and maintain a healthy weight, reduce the risk of chronic disease, and promote overall health,” says Sebastian.—By Rosalie Marion Bliss, Agricultural Research Service Information Staff. Alanna J. Moshfegh is with the USDA-ARS Food Surveys Research Group, 10300 Baltimore Ave., Bldg. 005, Beltsville, MD 20705-2350; (301) 504-0170. "Monitoring the U.S. Population’s Diet: The Third Step—The National “What We Eat in America” Survey" was published in the March 2012 issue of Agricultural Research magazine.